This post is sponsored by OLFA, but all opinions are my own. I’ve been using OLFA tools for years now, and when asked to partner with them to release their new 45mm Endurance Blade I was excited to participate! To the left is a few of my past photos including my OLFA rotary tools, and I shared a video of switching the blade on the Splash earlier this month too! OLFA is celebrating the release of the Endurance Blade with some exciting events too! 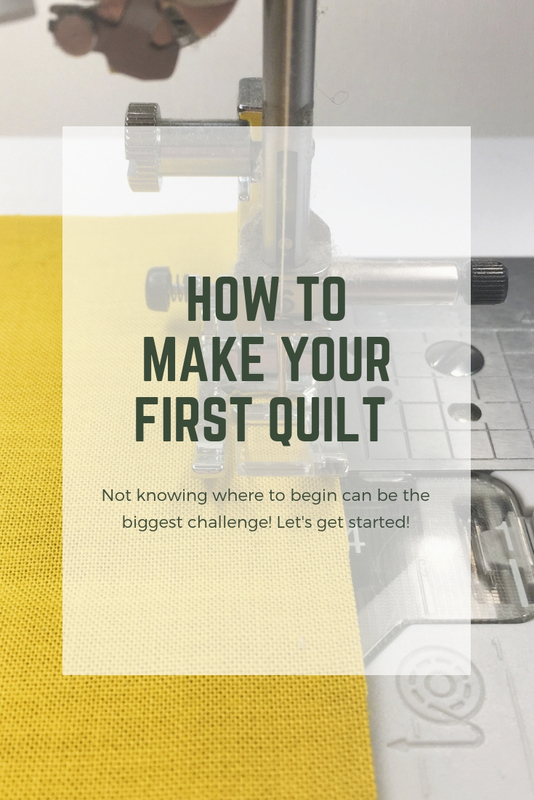 On April 27 & 28, during QuiltWeek in Paducah, KY, OLFA is creating an opportunity for you to test the blade, while cutting quilts for kids that need comfort the most. Quilts for Kids is a non-profit, that donates quilts to children’s hospitals and shelters across the country. Every square that is cut with the new Endurance Blade will be collected and made into beautiful quilts by volunteers! There’s also a Quilt Cruise Sweepstakes beginning on April 17th. Mark your calendar and check out the details HERE. Last week after receiving the new tools, I was working on sashing some improv blocks that I’ve been working on the last couple of months. We worked together well, with little need for pressure as the blade cut, and cut, and cut! I always love a new blade in my rotary cutter, but this felt even smoother than usual! 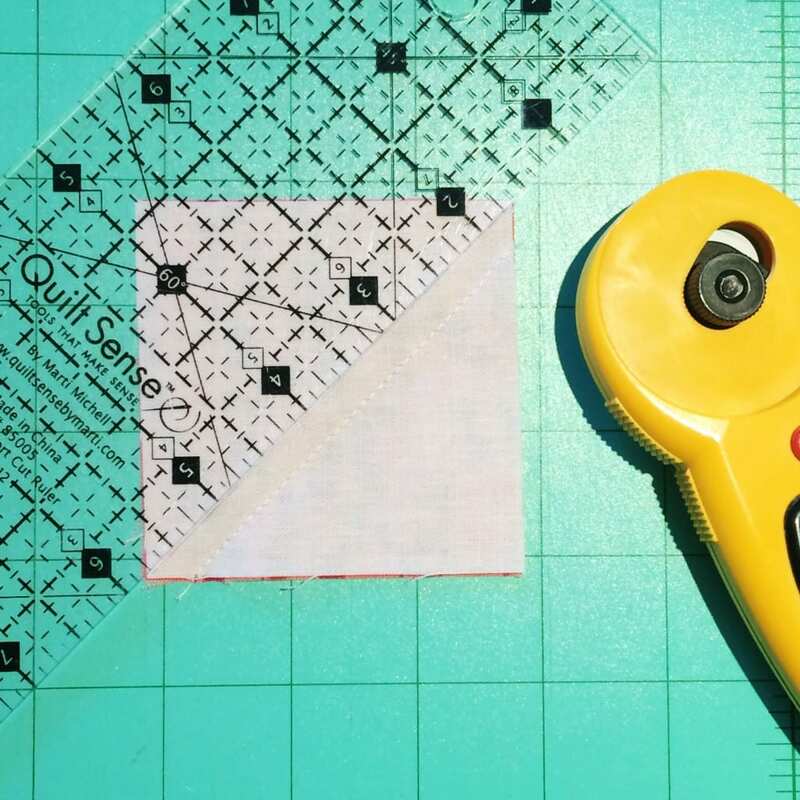 The best way I’ve found to size improv blocks, is to sew plenty of fabric around, then trim down using a square ruler to the size that you like. 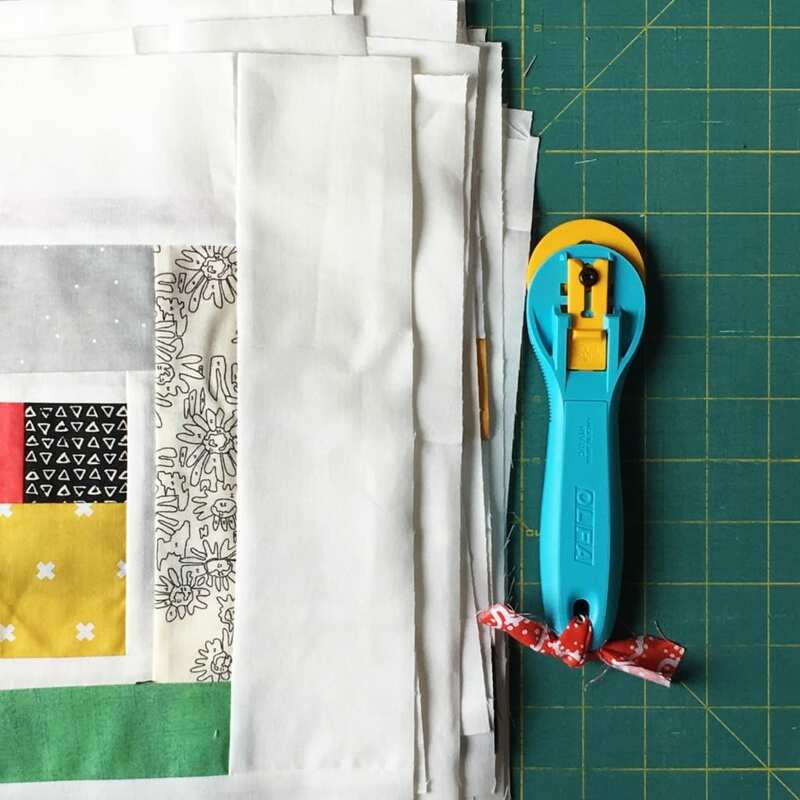 I have blocks ranging from roughly 6″ to 10″, and not at all square usually! 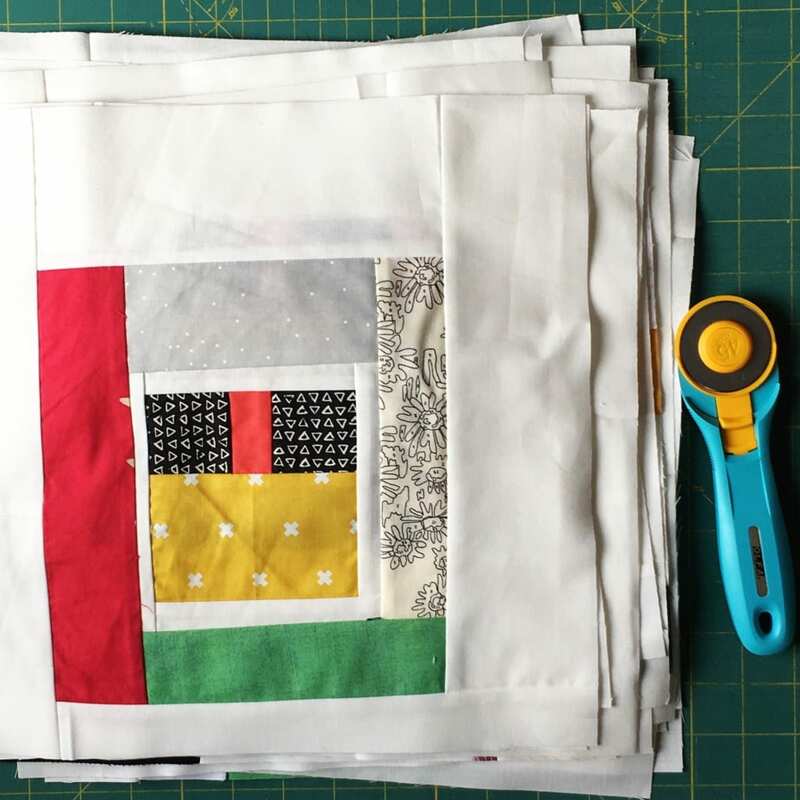 I sewed lots of white to the edges to set the blocks, before trimming to 12 1/2″ square. I also like to have my mat accessible from more than one side of the table – this way I can walk around the mat instead of twisting the block. I’ve decided to test the blade by using it every other time I cut, with my original blade. This Splash Cutter with the Endurance Blade in it is marked with a piece of fabric in the handle. I’ll report back with results in a couple of months! You know I’m already a fan of the Splash rotary cutter, and having a longer lasting blade is great! 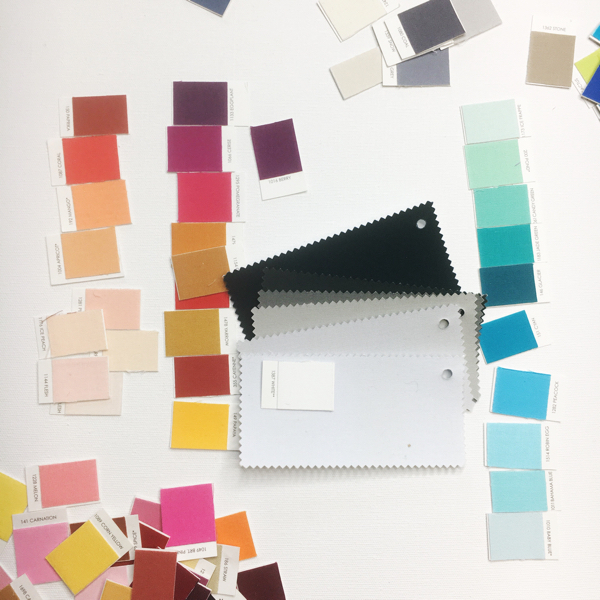 Splash is great for medium to heavy-duty projects, and can easily cut up to six layers of quilting cotton. 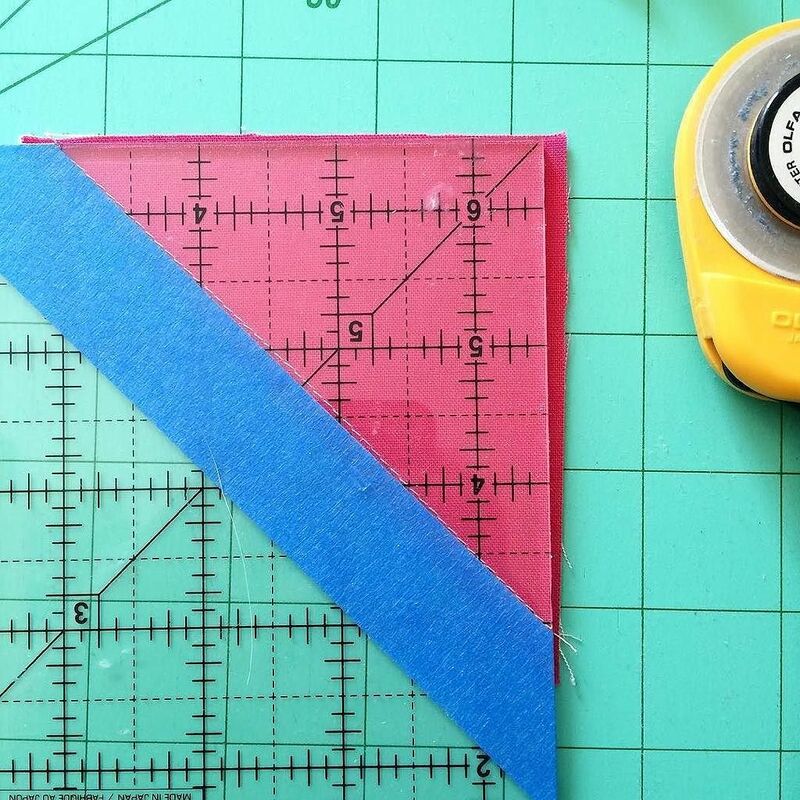 I use it all the time for cutting strips, and crosscut squares/rectangles in multiple layers at once. It also cuts more than fabric, but I suggest keeping a second blade handy for anything but cotton. 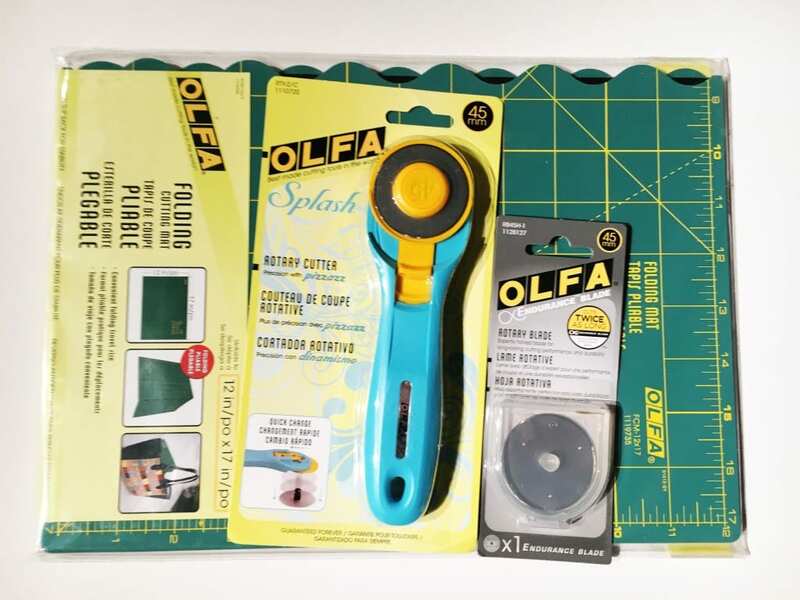 You can pick up your Splash Rotary Cutter HERE on OLFA.com and at Jo-Ann Fabric and Craft Stores, or ask for it in your local fine quilt shop. I usually switch my rotary blades at least once a month, depending on how many projects I’m working on – which definitely adds up. I’m really excited to put the Endurance blade to the test! The Endurance blade is made from expertly-honed tungsten tool steel with proprietary metal chemistry, it’s designed to cut twice as long, and fits the OLFA 45mm rotary cutters we already own. You can pick your new Endurance Blade up on OLFA.com and at Jo-Ann Fabric and Craft Stores, or ask for it in your local fine quilt shop. I will admit, I had been a little skeptical of the folding mats. I hadn’t seen it in person, or had the chance to put it to use. Seeing and using it now, I’m a fan! The folding mat is perfect for a retreat, or classroom situation, when packing space is at a premium, but a mat is necessary. Also in my own space, next to the machine it’s great too! 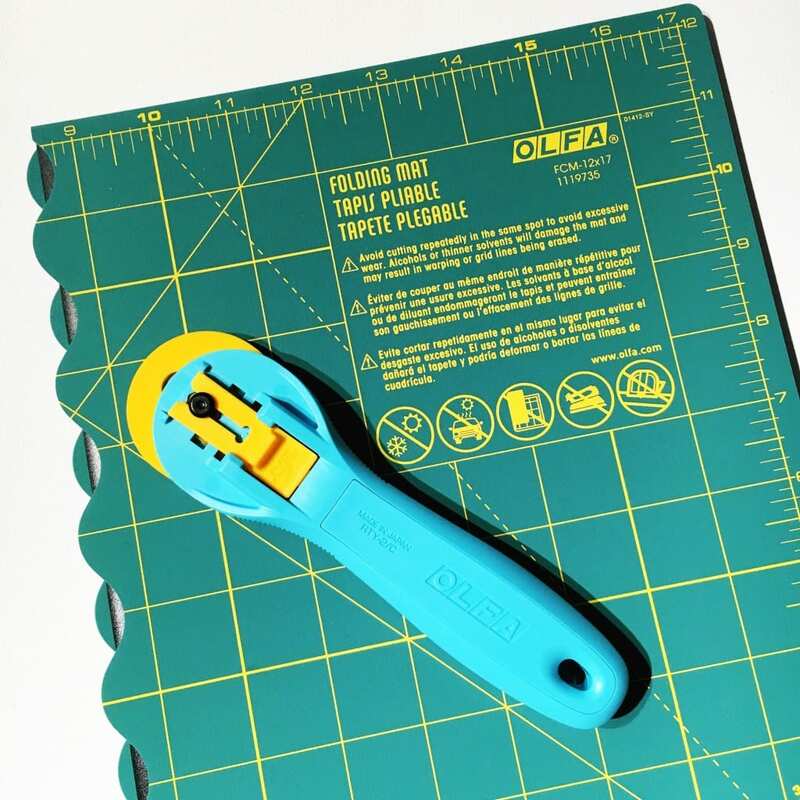 The curved fold means you can cut anywhere on the mat and have the results you expect from any cutting mat. The actual fold, is secure and durable too, which puts my mind at ease for future cutting mat purchases. 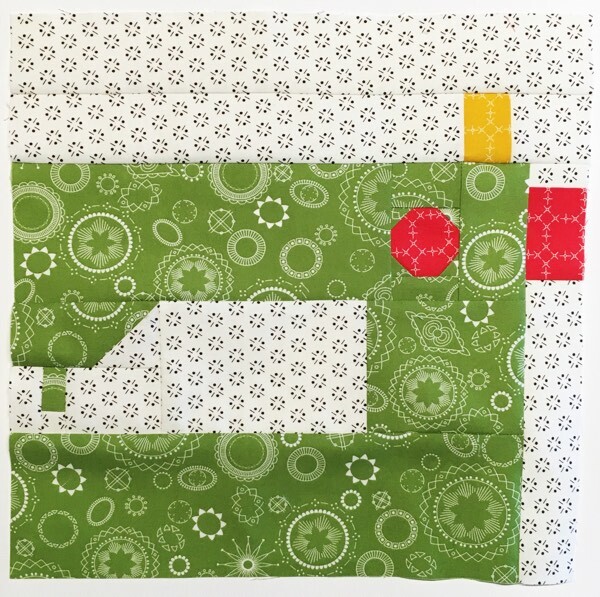 You can pick up your 12″ x 17″ Folding Cutting Mat HERE on Olfa.com and at Jo-Ann Fabric and Craft Stores, or ask for it in your local fine quilt shop. Who wants to win a new Splash Cutter + the Endurance Blade? To enter to win, leave me a comment. Tell me how long you’ve had your current blade on your rotary cutter. I bet it’s time to change it! Have you had a chance to try the Endurance Blade yet? I’d love to know your experience! 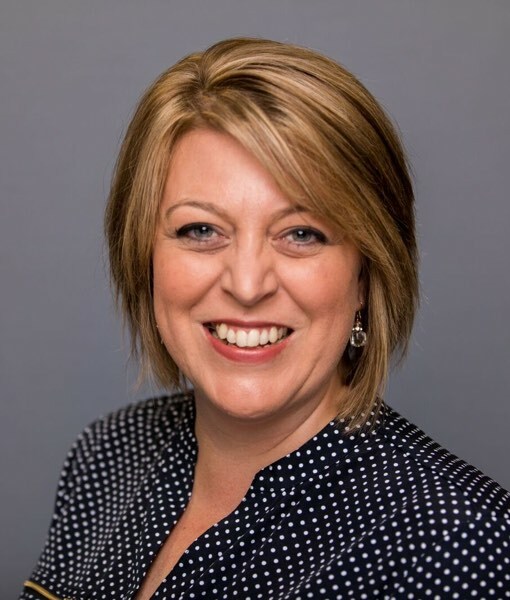 Congratulations Denise! I’ve emailed you to claim your prize. I have had the same blade for about 15 quilts, 3 bears, and 2 pillows. I think our is time to change!! Uhhhh long enough to not remember when I changed it Ha! I’m glad to say I changed it after finishing my last quilt, about a month ago. But it’s been used for a lot of little projects since then. I have no idea. I have tried to use a rotary blade sharpener, which worked OK, but I didn’t feel like the sharpened blade lasted as long as a new blade. I am interested to hear how the endurance works after a month or two. Or, I could win this giveaway and try it myself. I don’t remember the last time I changed my blade — over a year?! My blade has only been on 2 weeks, thought that I would try cheap ones, and cheap they are! Would love to try the Endurance blade!! I can’t remember when I changed my blade last…..ugh….i guess I’ll have to do it now! I switched just yesterday, but it was overdue! Current blade in 3 weeks, been making burb cloths and bibs! I just bought a new Splash and am using the blade that came with it. Im sure its only been about a month and I already feel like I need a new blade. DH even said ‘didn’t you just get that?’ I haven’t done a lot of cutting with it, but it sure is easy to catch the blade on the corner of your ruler which cant be good for it! The Endurance Blade sounds wonderful! I’m currently working on a project using Thangles and I will be changing my blade after squaring up. Cutting through paper dulls the blade. Uh Oh! I’d rather not say since I realized just the other day that the current blade is leaving those annoying thread connections (you know–where nothing got cut cleanly) about every 2 inches or so. Oops! I change my blade often. We are only as good as our tools. I changed my blade the day before I left for QuiltCon, but before that, it had been, I don’t know, I’m embarrassed to say, over a year at least!? I’ve had it on there for probably almost 2 months now… keep planning on replacing it but I get in a hurry and say “it’s only a few cuts and I’ll change it before next time”. I haven’t tried the endurance blades yet but I use Olfa rotary cutters always. I’ve had current blade in over a month. Anyone ever tried a blade sharpener? I have had my blade on my cutter for a few weeks, it is definitely time to change it. Oh boy, guess if I can’t remember the last time I changed it, it is time to change it! Thanks for the gentle reminder! I changed blades in all my cutters about a month ago. Hi Amy, I changed my blade a week ago, but like you say it does add up. It would be great having a blade that lasted longer (and not double the price ) and I would live to try it out! I changed mine three weeks ago. I would sure love blades that lasted longer. I switch my blade every couple of projects and save my old blades for paper! Two days. But before that like months and months and months. I can’t remember when. Over a year. I usually change when it stops cutting well. The 45 blade is less than 2 weeks old and I haven’t been using it. I put it on to begin a new quilt that has been postponed. I changed it a week or two ago. BUT before then, it had been a few months. I changed my blade about 4 weeks ago. I never write it down, but I know I always use it longer than I should. Every time I change it, it’s like cutting melted butter and I wonder why I make myself suffer with a dull blade. I would love a new longer lasting blade. Oh same blade it came with many moons. Sure want to try new one! It has been too long since I changed the blade on my cutter I am sure. Getting the uncut thread every few inches is a sign it’s time. Thanks for the giveaway. About a year ago I decided to change my blade every time I started a new quilt–now it’s kind of a little ritual for me. I’ve been trying to make a quilt a month, so every 4 weeks or so. I actually changed the blade last week, and I’d change again to try the new blade. Thanks for the chance! I just changed mine. I love a new blade!! Since I got it! Uh oh! Last summer in my sew sampler box! I love my OLFA! I have just changed my blade in the last month…couldn’t tell you when I had changed it though before that!! Thanks for the chance at great giveaway! Okay, so the honest answer is that I don’t remember how long the blade has been on any of my FOUR rotary cutters. 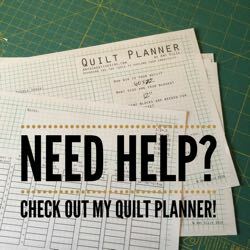 I use them all for different things and randomly change the blades when I notice they are dull or chipped or something… very bad behavior on my part… I could use stickers to put on my planner like I do with the dog’s flea medicine, a little reminder to change the blade. I should probably sell that idea, now that I think about it. I think about 2 months, I know I should change more often, but I tend to keep one until it takes a lot of pressure to make a cut. I’d love to win a new blade and cutter! Thank you for the giveaway! I just changed mine today after waaaaaaay too long in between the last changing. My blade has been in there for about a month. Would love to win and give this new blade a try. About a month. Needs changing!!! I don’t remember, but it needs changing. I like the idea of a longer lasting blade. Thanks. I changed my blade two weeks ago. I change them often. I once tried generic blades and they were awful. Olfa blades are the best! I’ve probably had my current blade for about two months. I was noticing today that it needs to be changed! I don’t change my blades as often as I should, and my needle on my machine is even older! I changd out my blade probably 3 months ago. Immediately after changing the blade I nicked a pin. Because it was a “new” blade I’ve been cutting and gritting my teeth for the last three months! It’s time to change it out! I go by how it feels and how my cut looks, cannot said a time limit. I am not sure, maybe last fall. Hi, I have had my blade in for about four months. 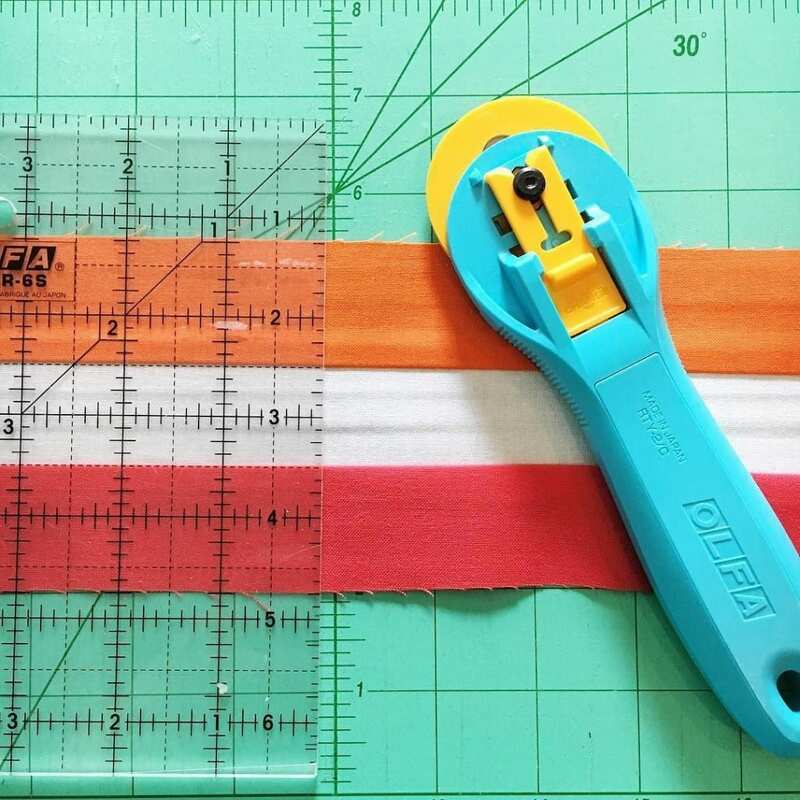 I use different rotary cutter for different projects so they seem to last longer. I have tried other cutters, but Olfa is by far the best. Have you tried the sliding one? You might not have to walk around your table as much. I hope the new blade works. Great giveaway. Thanks for telling us the truth on the projects you tried. My Splash is by far my favorite cutter ever! It fits my hand just right. I think the current blade has been in use since Christmas. 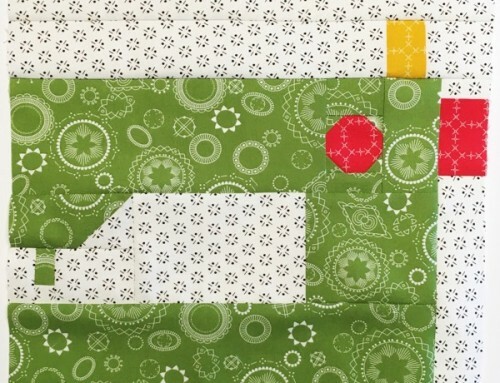 I haven’t bought a new rotary cutter in over 10 years – so this would be a treat. My current blade was changed about 6 months ago – but I haven’t been using it . . . so we are still good to go. Thanks for the review! Uh oh. I have no idea how long my blade has been on my rotary cutter! To be fair, I just inherited this particular cutter from my husband’s grandmother who recently passed away. But, she was a prolific quilter herself. Sooooo it’s probably way overdue for a fresh blade! The last time I changed my blade was Around August I think……. I just got a new Olfa for my birthday on March 3, so I’ve been using my current blade for 20 days! I think I have had mine on for 5 or 6 months. I don’t do a lot of cutting during the winter (too cold in the kitchen) so it hasn’t been getting a lot of work. It still is doing good but would LOVE to try the new blades! O Amy! I am much too aged to know when I last changed the blade. In the past 2 weeks I think. I just changed last week. It had been too long. 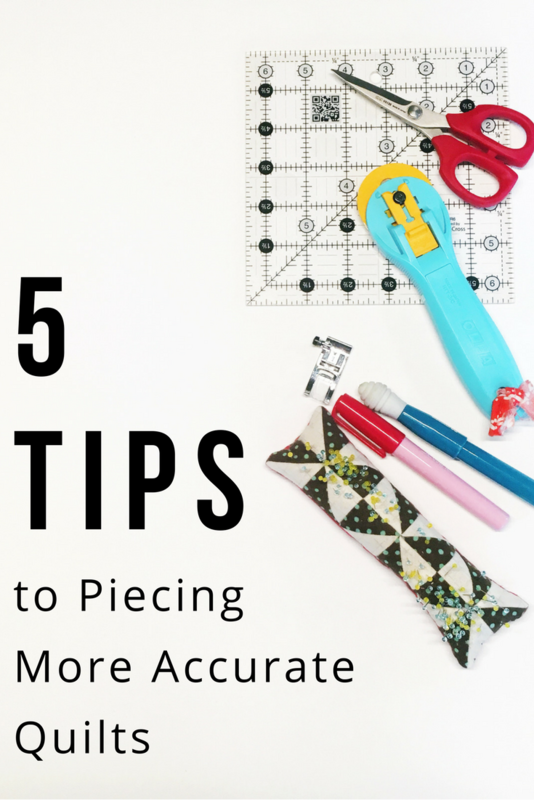 I changed my blade about 7 months ago…need to get a second cutter dedicated to my paper piecing. My blade has been in my cutter for about 1 month though I only had time to cut a few strips for a quilt with it. There is still plenty of cutting left in that blade. I like to keep a stack of new blades handy. there is nothing like the feel of your rotary blade just slicing right through your fabrics. I’m pretty good about changing my blade. I don’t keep track of time but as soon as I feel it’s getting dull I change it. And I feel fine cutting up to 12 layers so I’m sure curious about the new blade. I changed my blade when I stayed a new project about 4 months ago. It’s still hanging in there! Not too long, but I’m surely due to change it. I learned the hard way that dull blades can cause you to push harder and maybe accidentally slice through a finger, requiring 9 stitches….. It was probably back in October or November. I’ve just recently noticed it’s not cutting as well as it should, so I really should go ahead and change it now! I hate dull blades I change them all the time. Probably Monday. I hadn’t heard of the Splash cutter…and now the Endurance…hmmm – I definitely have to think about the Splash cutter. As for changing the blade – I’m so bad at that – I normally don’t change it until I have 3 or 4 placed I have to go back and snip. I know I should change it more often, but it’s such a pain…so maybe that Splash is what I need! I changed it in January. I remember because I was packing to go to a workshop. I am looking forward to trying the new type of blades. I currently have an endurance blade on and I think I put it on about a month ago. It’s going OK but it’s hard to compare if it is doing better than my usual blades by this point since the amount of cutting I do fluctuates so much, so I love that you’re doing a much more scientific test! 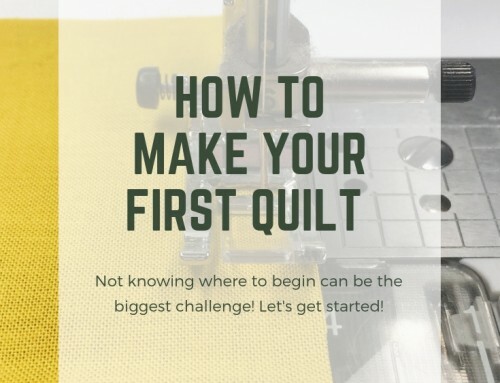 I started quilting one year ago. But in such a short time it is not cutting clean. I’m not sure if it is the cutter or my technique. It only cuts cleanly only when the ruler slips LOL. Count me in….. I put a new blade in my cutter on Friday…….. was going on retreat!!!!!! Interested in your folding mat comments…. I cut up old mats that have bad places for small mats by machine – etc. I just changed it about two weeks ago and I already have a nick that leaves one thread uncut! My current blade has been used about 3 weeks. I really get aggravated at the frequency it needs to be changed. Definitely been at least several months for me… can’t remember when I changed it! I know it was just after Thanksgiving because I wasn’t used to the smoothness of my new blade and end up pushing too hard and slicing off the end of my finger and spent most of December with a huge bandage on it. Please tell me we all have stories like that? I’ve had my blade in for about 1 week. But I have been guilty of not changing it often enough!!! I switch mine about once a week as the blades dull so fast. I do lots of scrap cutting using the Stripology ruler and making set sizess, so I wear them down fast. I don’t think they are as sharp as they could be coming out of the pack. I am on my third quilt with my current blade, and as long as it works good and cuts the first time; I don’t change out. I write on mine with a sharpie when I change it and it was done Jan 2017. Otherwise I can never remember how long it’s been. I didn’t switch my blades yet,but I did sharpen them last month. I have not tried this Splash cutter yet. Always up for a new tool. Interested in trying both the Splash and the blade! I think I changed my blade at the end of January, but I haven’t done much cutting lately, so I could deduct several weeks from that! Though I often think my blade is just fine, until I change it and realize that I never notice how dull the old blade is until I’m cutting with a new one! It always feels so good when you first change the blade, but mine never seem to last long. I think I changed mine before going on retreat last month. Thanks for the chance to win. My hubster changed my blade on my cutter about a month ago. I haven’t cut much since then due to a family death. I look forward to trying the new Olfa blade! I have several rotary cutters so I get confused as to when I change the blades. I always keep extras on hand so than when the whichever blade begins to appear dull or has a nick in it I switch it out. I enjoy all my Olfa quilting tools. Will be interested to hear how the new longer lasting blade works out. More than 3 months and 3 quilts ago. I am using a titanium blade that is supposed to last long – so far it has. About 3 months……not a lot of cutting lately so I’m good for a bit. 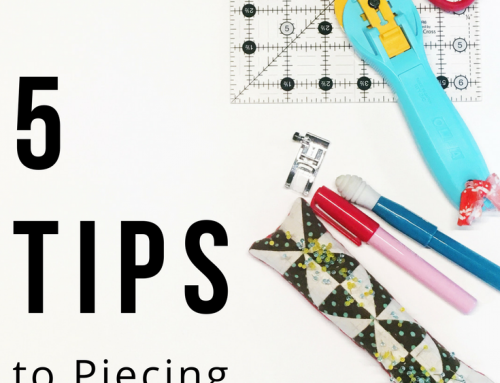 I tend to leave them on too long, until I am cursing that it is cutting poorly. Usually it is about 2-3 quilts, but I know I should change more often. Like you, I love the feel and ability of a new blade! I look forward to this new blade, sounds good to me! Can’t remember when I last changed my blade! Definitely time though. My current blade skips. I hate that! Olfa cutters rock! I haven’t gotten the opportunity to try out the new blade. I actually changed my blade a couple days ago, it had cut ALOT of fabric! Thanks for your newsletter!! Good luck everyone in the giveaway!! I try to change blades often. BUT…The last time I changed blades on a product that was not an Olfa, I never got the blade in correctly and it was a disaster! I now purchase Olfa products and only Olfa! There are so many brands of cutting implements, but I won’t waste time or money on them. I love Olfa products and am brand loyal! I vowed to change the blades in both cutters I have on Jan 1. I did change one but thought maybe I can use the other a little longer. Now I have had the dull blade in 3 more months than I wanted to and it has been in the cutter for almost a year….yikes that is bad! Around Christmas, I changed the blade and purchased back up at Joann’s. I’ve had the same Olfa cutter for ever, never tried anything different and I only have the one :) I love it dearly! I use an Olfa cutter, but it’s relatively new. It’ll be nice to have blades that last longer. Mine has been in for about 2 weeks. I just changed it after cutting all the 3.5″ squares for my twin size Quilt. Piecing and trimming with the new blade. I could have continued to use the old blade but cutting through seamed pieces with my arthritic hands would have required more pressure than I was was willing to have to do. Have always used Olfa and am anxious to to try out the new endurance blades. I purchased my Olfa cutter last year sometime and it still has the original blade on it. IDK why, but I never change the blades in my cutters until they just don’t cut fabric anymore. Maybe it’s because I’m too cheap to keep buying the blades every time I turn around! Haha! I use the Olfa Splash cutter. The blade was changed about 2 months ago. It hasn’t been used in the last month because my husband and I were traveling. Probably a couple months. I expected to have to change it three weeks ago when I was on a quilting retreat. But since it didn’t give me any trouble, I kept using it. I never change my blade until it fails to cut through all the layers of fabric a few times in a row. If it’s annoying me, it’s time to change it. I “TESTIFY”!!! Almost 2 months: I bought one of these Endurance blades in January at Road to California, put it in beginning of February and she’s still cutting like NEW. I cut a considerable amount of fabrics too. About 2 months, but way too long before that! Would love to try endurance blade. I should keep better track. 2-3 months but that’s using 4 or 5 different cutters. Every month sounds like a good idea if I was primarily using one. I have absolutely no idea. 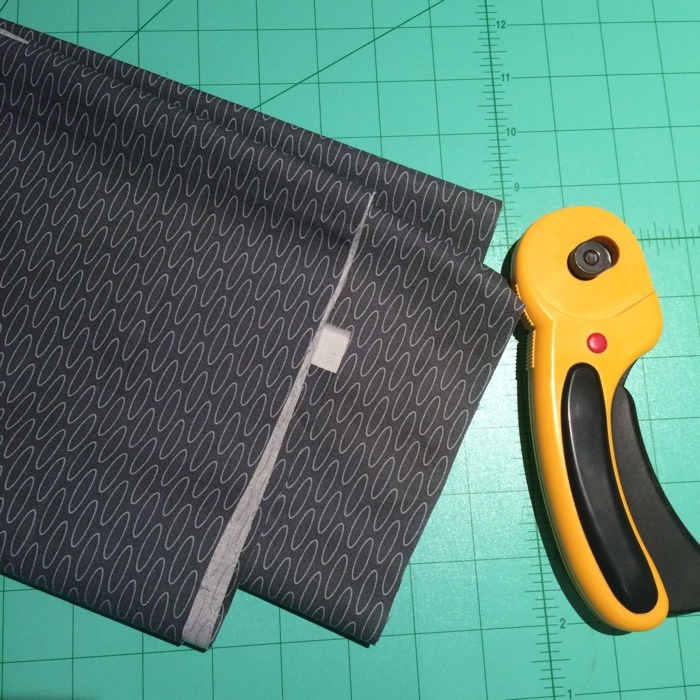 I found my current rotary cutter in a drawer in my sewing room…noticed it cut better than the one I was using, so switched. both need a new blade! The blade has been on my Olfa cutter for at least six months… and I need to change it. I nicked a straight pin yesterday, and put a skip into it. Darn. I’ve had the blade on my cutter a few months. I don’t get to cut and sew much, but it’s still time for a new blade. I put a new blade in my cutter about 3 months ago and it probably needs to be changed. I don’t know why I wait so long! I would love to try out the new blade–I guess I just don’t like to change them out! Just changed it at a retreat so I’m good for awhile! I have only had my blade on for about 3 months and have cut about 2 quilts worth. But the blade has not been cutting smoothly from about half-way through this time. I have to use extra pressure and sometimes cut more than once to get a clean cut. I don’t have the money to just get a new one, considering this one wasn’t that old when it started to not work properly. I’ve had the blade for 6 months. I do use a tru-cut blade sharpener though. I started a quilt class and couldn’t remember when I had changed it and it was cutting sketchy so I replaced it within the last few months. Busted! I’ve had my blade on for far too long and it’s definitely time to change it. This year? I really don’t know. I haven’t done a lot of sewing the past couple months. I cut patches for a quilt earlier this week and it still cut smoothly, so I’m good. Thanks for the opportunity to win! 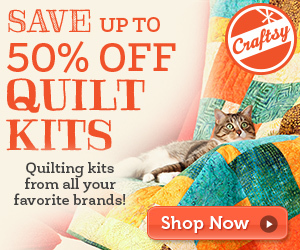 I have had mine in for at least two quilts and it’s getting pretty dull. I know I should change more often but would love to give yours a try to see if it lasts longer. I changed all of my blades about two months ago and they are still sharp enough. I changed mine last weekend when I couldn’t stand the old one for one more minute and I was getting ready to start a new project. About a month ago….was wondering why it took me so long….what a difference a new blade makes! I changed my blade about a month ago. Since getting a new cutting mat that fits the entire top of my cutting table, I find I have to change my blade more often, as the surface of this mat seems to require a really sharp blade. It is a green self-healing mat, but has a firmer surface than the Olfa mats. I’ll be curious to see how these new blades hold up on my mat. I changed mine yesterday. I love an easy cut so I do change my blades frequently. My blade is pretty new but used by my granddaughter who can’t seem to NOT run the vet the ruler! So this one is “kaput” after one use! I have three rotary cutters that I use and, because of that, I can never remember when I changed my blades! I just wait until I notice that they aren’t cutting well and then I change them. The idea of a longer lasting blade is VERY exciting! Even better would be a reliable way to sharpen the blades. I find it so wasteful to throw them away, so I don’t. I just keep them in a tin waiting until the day I try taking them somewhere to see if they can be sharpened. Funny story. 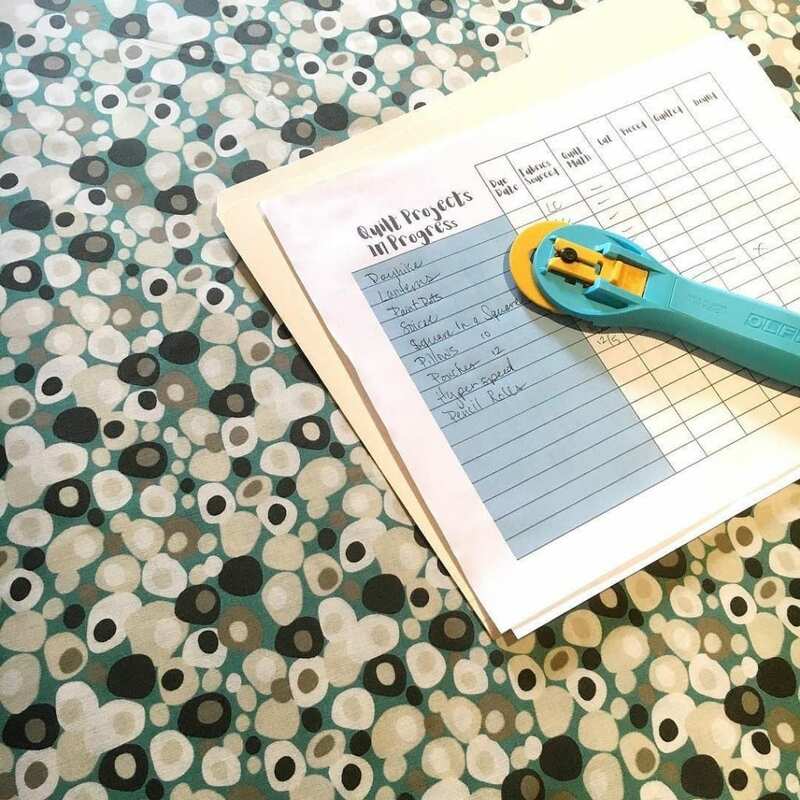 I lent my splash cutter to a young woman who I was teaching to quilt. I knew the blade would soon need to be changed so I sent her a package of blades as well. When I got the cutter back and went to use it, I noticed that there were soon so many threads and shreds everywhere. It turns out that when she changed the blade, she mistakenly put in two blades instead of one. You know how the oil really makes them stick together. What a mess it makes to use a double blade! Oy oy oy! Was about to proudly claim that I have a “brand new” blade in my rotary cutter, but now that I think about it, no. It’s been at least two, maybe three months since the current blade was brand-spankin’ new. Still, I call that blade infancy compared to how long I’ve gone between blade changes in the past. 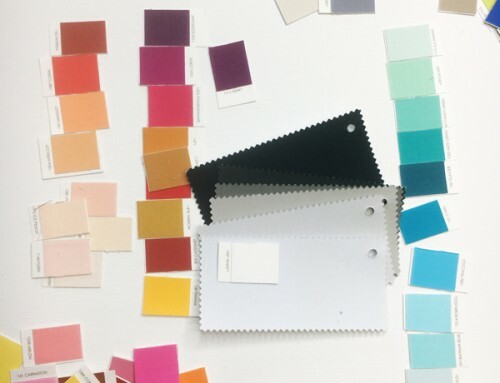 Love that blue rotary cutter, BTW, am putting it on my wish list for the color alone. As a matter of fact, I just changed it about a week ago! But if you had asked me a week ago,I probably wouldn’t have been able to remember. I have had my Olfa blades in my Splash cutter and one of the original 45mm cutters about 3 months. I do so much piecing, quilting and making quilts for charities that I change them more frequently than usual. I just bought a new Olfa mat, so I’m hoping my blades will last even longer.! Would love to test the Endurance blade to see if it REALLY does last longer. Thanks for the opportunity to win one. The blade has only been on my cutter for two days. I try to change it often so I don’t aggravate my tennis elbow. I’ve used my blade for a boutique 6 months, nicks and all.I’ve been thinking blades don’t last like they used to. Would love to try this! Actually I changed the one here at home in November and the one at the cabin last summer when it was skipping! But I don’t get to sew all the time. Can’t wait to retire so I can! I would love to try the new blade. I’m one that doesn’t change them until necessary. Yep it is overdue, it’s been a year, every time I use it I tell myself I need to change it, but then I get busy and don’t do it. Why do we wait so long? Could really use one of those longer lasting blades. You’ve got that right! My blade definitely needs to be changed. I’ve had my blade in y cutter for…I don’t know how many months! I could use a new one. I’d change it more often but I’m too cheap. I’d love to try a longer lasting one. I JUST changed my blade, in time to trim about 256 HSTs. So glad I did! I’m such a cheapskate and I forget how wonderful a sharp blade is! Just changed my blade this week. I am like lots of others, I wait too long to change,y blade. Finally I decide this is ridiculous and change it. I love it when it cuts like a charm–so,why do I wait? One blade I marked 9-24-16, but I have not used it much, as I have three others and they were all changed about 2 weeks ago. Forgot to mark on the blades though! I cannot remember when I changed it last. I think I need the endurance blade and a Splash cutter. I just changed mine, but before that…it’s been a while. I just finished cutting up 8.5 yards of fabric into strips, squares and rectangles for my next project and by the time I was finished, each cut was getting pretty ratty! I’m so looking forward to these new blades! Thank you for the giveaway–fingers crossed! I changed my blade about 2 weeks ago, but, like others, I usually procrastinate changing it, for some reason. I hope the Endurance blades do last longer. Would love to win the rotary cutter and blade! I have no idea when I last changed blades. I hate changing blades. But, I have learned that it is quicker to just change it when cutting starts to require more pressure or when threads start being skipped. It is so much easier to just change the blade than to keep putting it off. I change my blade whenever it stops cutting properly. I hate having to run it over the same place more than once. I have this cutter and I can’t tell you when I last changed the blade. I love it, also I like it because it is so light weight. Way too long, and you’re right – it’s totally time to change it out. Looking forward to these new blades! I’m sure I need to change the blade. It’s been 5 months and I have a couple of nicks in the blade, so you know it’s time. I’d love to try the new blades. Would be great, thanks for this opportunity! I remember changing my blade over the Christmas holiday, lots of last minute projects getting done. Love the feel of a new blade, cutting like butter through the fabric. Thanks for the chance to win this beauty! I’ve had mine on for around 3 weeks. I hate it when you cut and get lots of skips! Would love to win a new one. I have tried writing the date on my cutter when I install a new blade, but that didn’t work very well because I don’t cut the same amount of fabric daily. Definitely do a change out as soon as the blade skips. Will be watching to see your review of this nifty new type of blade. Thanks so much for the chance to win. When the blade starts skipping, I sharpen it. If it still skips, I change it. I can generally use a blade about twice as long since I got a blade sharpener. I’ve had mine in about 2 weeks….but I generally don’t change it often enough…..the endurance blade sounds like a good idea…..especially if one is cutting fabrics every day. It’s been a couple of months since I changed my blade, but it’s still pretty sharp. I do more quilting of quilts than piecing. It seems some blades last and some don’t. I’d really like to try out this new one. Gosh, I’m not sure how long I’ve had this blade. I have two cutters-one next to my cutting table and one here in my main sewing room. I think I flipped this one here several months ago. Probably a little over a month ago I changed my blade. It will be due for a change soon as I have several projects in the works. I changed my blade 2 weeks ago when quilting with a friend day, but will need to change it soon as have been trimming a lot of paper pieced blocks. This new one sounds great. I change my blade with every new project…..old blade is transferred to cutter I use JUST for paper and crafting items. Starting each project with a new blade just makes a smoother start to that new project. Frustration and mistakes seem to snowball when you DON’T start with good intention. I’m guessing it’s been at least six months since I changed my blade (blushing here). Think I’ll go do that now! LOL that folding mat sounds like a genius idea! I just changed mine in the last month. However, I can’t remember which rotary cutter I changed! That’s the problem with having 2! I think I need to come up with a system of noting when I change them out! Well, how old is my blade???? Oh my, working on four different projects for the last 10 weeks, I would say my blade is probably 3 months old. Yep time to replace, especially when it starts skipping!!! I know I put in new blades (several cutters) before I left on a quilting cruise the end of January. However, since then I’ve cut out 10 quilts. I do try to push a blade, as long as it mostly cuts I want to make it work. Fingers crossed on the new blade and I love Olfa cutters. I really like the mat too. I bought one when they first came out, it is so handy for traveling. Thanks. I can’t remember, but we have been packing and downsizing for a move we made on March 8. Still have not unpacked my sewing room. It would be great to have a new Olfa and the new endurance blade to start out in a new adventure. I just purchased one of the new Endurance blades this week and promptly put it on my cutter. WHAT A DIFFERENCE! I am pretty good about changing my blades often – at least once a month – because I like quick clean cuts. This new blade required hardly any pressure and went through 4 layers of fabric like butter! I will be using these blades from now on, keeping my last regular Olfa blade for cutting when I use paper triangles. Guess I should pick up a second handle for that. Thanks for the review on the cutting mat too! I change my blade often to maintain clean cuts, the last time about 5 days ago. Quite costly to do, but necessary. I changed my blade last week – it had been a while. I can’t remember when I changed my blade – so obviously, it’s been too long! I’m guessing a year ago. Should maybe write the date on the blade. The last time I changed my blade was right before I made eight table runners for holiday gifts 2016. I sew for a charity. I sew about ten outfits per month. I need to change out my blade every month. Just changed my blade 2 days ago, after several projects. Would like to try the new Olfa endurance cutter. I changed my rotary blade 2 months ago. I definitely would love to try the new Endurance. Blade. I changed my blade earlier this year, but I haven’t done too much cutting with it. I think it is good to go for a while yet! I changed my blade last week, however I couldn’t tell you you how long the one was on before that! I stretch it as far as possible! Hmmm… I think I changed it before my last project, but I’m not really sure! Hmmm… at least a couple months! I switch between two, but then both are requiring more muscle to use than they should! I sharpened one of my blades a month ago so will have a little more time with it. I would love to try the Endurance blade. Longer than I can remember. My next shopping trip will have to be a new blade. I think I changed my blade around Christmas time when I was cutting fabric like a maniac for a gift. It’s time, I know, to switch it out! I am not sure how long I have had this blade in but I know it skips cutting a tiny little bit every rotation. This drives me nuts. Probably too long..have cut 2 baby size quilts/6-7 yards ish. And trimmed the batting off several smaller projects. I put in a new blade a number of years ago. but after each project I sharpen the blade. I’ve never replaced the blade- thinking now that it might be a good idea! I’ve been using this rotary cutter for almost TEN YEARS! It takes several passes to go through one layer of fabric. But at least I can’t cut myself on it! I just bought the splash and have only cut one quilt with it, would love to try the new blade. I’ve actually been pretty good :) Since January, have made 8 quilts (mostly throw and crib sizes, but one twin-size) and am working on #9. I changed my Olfa blade about 2 quilts ago, which would be just before the twin size quilt. Thanks for the chance to win ! I went on a quilting retreat in early March, and I changed it then. But before that…it may have been 6 months! I can’t remember the last time I changed my blade, maybe November? I just cut out a quilt with 1038 pieces plus I still have the sashing to cut so my blade is toast. Last time I changed my blade was 2 weeks ago when I started cutting out fabric for a new quilt! I change the blade each time there is a tiny thread not cut ! So it depends if I am doing a lot of cutting,! I buy a lot of blades !!! Chantal from France ! My last change was a week ago for a Jacqueline DeJonge Retreat. Before that it had been at least 6 months. and probably 2 quilts cut. I’m not really sure, but at least six months. I’ve barely used it in that time though, so it’s not as bad as it sounds. Just put a new one in about three weeks ago, but have been giving it very heavy usage for making my new quilt. Still going strong, but don’t expect that to last as long as I’d like! Mine is about 2 months old now…which is BAD because I use it every day for many hours! It has nicks on it because it is not cutting all the way thru the fabrics! Tomorrow….yes…I will change it tomorrow! Umm, I’d say at least 6 months…..shame on me. Over six months, oh my! 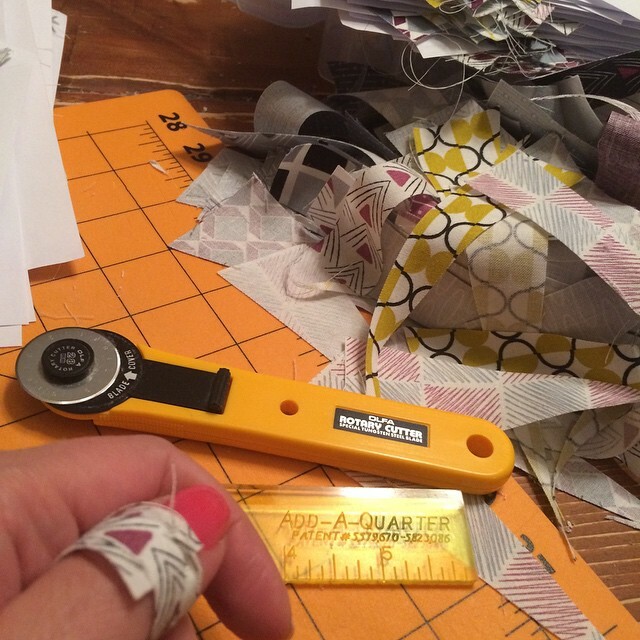 I don’t even have my own rotary cutter – I borrow my friend’s.